If you look at an American one-dollar bill you will find a pyramid with an "eye" on top. The Great Pyramid is often associated with Freemasonry, and many of the American founding fathers were Freemasons. The symbol comes from the Great Seal of the United States designed in 1782 by Charles Thompson. In 1934 the Secretary of Agriculture Henry Wallace convinced Secretary of the Treasury Henry Morganthau to place it on the dollar. It appeared in 1935. Morganthau did not know at the time that Wallace made the suggestion at the behest of his guru Nicholas Roerich. To Roerich the "eye" represented the gaze of mahatmas or super-evolved beings that guide the affairs and spiritual evolution of humanity. Roerich (d 1947) and his wife Helena (d 1955) followed the Theosophy of the colorful 19th century occultist, Helena P. Blavatsky (1831-1891). The Roerichs established a new Theosophy group called Agni Yoga by 1925 in New York and London, and later in Latvia, Russia, and India. Like Blavatsky the Roerichs believed that "mahatmas" had chosen them as messengers to an elite core of mankind. Roerich died the year I was born, so by the time I encountered his art and Agni Yoga teachings in 1975 his legacy had faded considerably in America. For example, as late as the mid-1980s Agni Yoga did not make it into an impressive list of new religious movements established by the Institute for the Study of American Religion. Roerich’s greatest achievement in America was through President Franklin Roosevelt to have 21 nations in the Pan-American Union sign the Peace Pact, also known as the Roerich Pact, in 1935. The Pact was intended to preserve cultural creativity in hospitals, museums, and significant religious sites in time of war. For his effort Roerich was nominated for a Nobel Peace Prize—he did not win. In a way Roerich, who was an accomplished artist, and his wife Helena, who "transmitted" the Agni Yoga spiritual teachings, were my favored gurus from 1975 –1982. I mention this because I gained an intimate insight into their work, history and devotees. I met with the last two directors, both gracious individuals, of the Roerich Museum in New York many times. I also had occasion to study several offshoot groups that used the Agni Yoga teachings in their core doctrine. The largest of these was the Church Universal and Triumphant cult that used Roerich art images and teaching without permission from the Agni Yoga Society. The second largest inAmerica was the Aquarian Educational Group founded by Torkum Saraydarian. That brings me to this book that I am about to review, Theosophy and Culture: Nicholas Roerich, that a Roman Catholic press associated with the Vatican published last year. Why, I asked, would the Catholic Church bother to publish an extensive study on a new religious group rarely even mentioned by religious scholars in America? My answer came when I discovered through Internet resources that the author had written this study initially in 1997 as a student dissertation (under the direction of Dr. Michael Fuss) to address the phenomenal growth of the "Rerikh societies and groups" throughout the Russian Federation since the late 1980s. According to Anita Stasulane, a religious scholar from Latvia, the Roerich teachings have "captivated the minds of millions" in the former Soviet Union. The publisher sent a review copy to the International Cultic Studies Association that referred it to me. Anita Stasulane did a remarkably even-handed job delineating essential aspects of the Roerich approach to theosophy and culture at large. I can hardly imagine how someone not familiar with Helena Blavatsky (the author refers to her as Yelena Blavatskaya) might appreciate this study, but there is just enough essential information to give most readers a good grounding to understand Roerich in context. The text is heavily footnoted with a majority of Russian language references. Some of the text is in French, especially when quoting René Guénon, an esoteric scholar who was critical of Blavatsky’s writings and claims. In that regard the study would suit the religious scholar or a student familiar with languages better than the average American reader. The author quotes extensively from primary source texts of Agni Yoga and the two volumes of published Letters of Helena Roerich to define for the reader exactly what the Roerichs teach and believe. Stasulane demonstrates that the Roerichs teach that the great religions including Christianity and Indian religions have distorted the pure teachings of their founding prophets. With Agni Yoga, or the "Teaching," the Roerichs viewed themselves as emissaries of the master Morya and other mahatmas who will draw enlightened seekers toward the one Truth or Ancient Wisdom. Despite the Roerichs’ claims to "the highest" spirituality, Stasulane shows that the Russian couple defines or reduces religion, whether Buddhist or any other, to a version of "Blavatskaya’s" theosophy. The latter’s genius was to apply a spiritual form of evolutionary theory to human destiny supported by stringing together a myriad of 19th century occult teachings. The result in both Theosophy and Agni Yoga, as the author demonstrates, is a highly suggestive, vague notion that we are destined to return to the impersonal Source of Being after efforts in many incarnations. The real, unvarnished Truth is thus hidden or occulted from the uninitiated or ignorant. Stasulane’s study should impress any reader with the richness of thought and lofty efforts of the Roerich agenda for humanity. 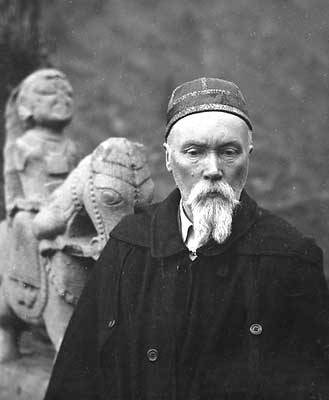 She shows that among theosophists Nicholas Roerich stands out mightily as a particularly accomplished artist and teacher. In the end she writes that Roerich in 1926 visited and approached the Kremlin with his blessings for the communist regime. The author does not mention this, but Roerich did praise Lenin at the time as a "mahatma" on the order of his Morya. In the author’s opinion Roerich believed that Theosophy, as a "theosophocracy," would be the proper route for the people in a "New Russia."